Zimbabwean President Emmerson Mnangagwa promised a “thunderous victory” as he and main challenger Nelson Chamisa on Saturday rallied supporters one last time ahead of Monday’s election in a country seeking to move past decades of economic and political paralysis. The vote will be a first for the southern African nation in which longtime leader Robert Mugabe won’t be on the ballot after resigning in November following a military takeover and pressure from the ruling ZANU-PF party that once backed him. The majority of Zimbabwe’s 5 million voters grew up under Mugabe’s 37-year rule. 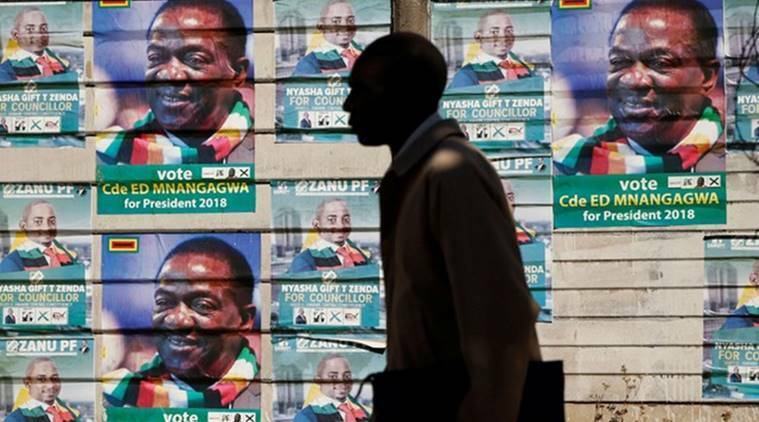 Zimbabwe’s President Emmerson Mnangagwa has announced that a general election will be held on July 30 – a vote that could be crucial to securing foreign investment. Supporters of the 75-year-old Mnangagwa, a former Mugabe deputy, and the 40-year-old Chamisa, the leader of the opposition MDC party, rallied at separate venues in Harare, the capital. A credible vote could help Zimbabwe to shed its longtime status as a global pariah and spur recovery for its collapsed economy, while a contentious election would prevent the lifting of years of international sanctions. “We have opened the country to the world,” Mnangagwa declared Saturday, claiming that hundreds of investors had poured into the country since he took office with billions of dollars in commitments. Many in once-prosperous Zimbabwe, however, have yet to see any effects as they continue to stand or sleep in long lines to access dwindling cash. “Allow him to finish the job he started,” said one supporter of the president, Erica Chindoma, who like many was bused in by the ruling party to attend the stadium rally under heavy security. In an interview with The Associated Press on Friday, Chamisa alleged that Zimbabwe’s electoral commission is biased in favour of Mnangagwa, which the president and the commission denied. Chamisa vowed to hold peaceful protests if the election is flawed. Past elections under Mugabe were marred by violence and intimidation against the opposition and by alleged vote-rigging. Foreign observers were shunned. Now Mnangagwa, once Mugabe’s enforcer, praises “this beautiful democratic process” and dozens of foreign observers have spread throughout the country, including teams from the United States, the European Union, the Commonwealth and the African Union. “We are aware of the issues that have been raised by opposition parties, however we hope that the elections will be free and fair,” US Senator Jeff Flake told reporters on Saturday. Concerns have focused on the military’s influence, especially in rural areas, and on the lack of transparency in the voters’ roll and ballot paper. Mnangagwa himself remains under US sanctions. Not everyone was joining Zimbabwe’s election excitement. “l will not waste my time queuing to vote. These politicians are all the same, they lie,” said Jackson Mundopa, a 33-year-old who said he would use the extended weekend to visit family. Monday has been declared a national holiday.